April 24, 2019  NPR's Ari Shapiro talks with Abe Denmark, former deputy assistant secretary of defense for East Asia, about the summit between North Korean leader Kim Jong Un and Russian President Vladimir Putin. April 24, 2019  Authorities blame Islamist extremists for Sunday's bombings in Sri Lanka. Some Muslims are on edge. NPR's Audie Cornish talks with Hilmy Ahamed, vice president of the Muslim Council in Sri Lanka. April 24, 2019  Sri Lanka's president is gutting his security services after failure to act on intelligence that may have prevented Sunday's terrorist attacks. Funerals have begun for the more than 300 people killed. April 24, 2019  The summit in Vladivostok marks Kim Jong Un's first trip to Russia and first meeting with the Russian leader. The Kremlin said they would discuss denuclearization. April 24, 2019  More than 100 shipping containers had been declared to hold recyclable plastic scraps. 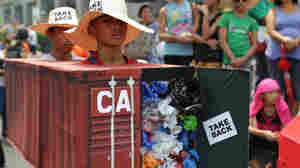 But when they arrived in Manila, officials found household trash, including adult diapers. April 24, 2019  The picture emerging of the perpetrators of Sunday's attacks that killed more than 350 people is one of relative privilege. The country's defense minister says one bomber had studied in the U.K.
April 24, 2019  Rachel Martin talks to political columnist Jehan Perera, who explains the social divisions in his country, and to reporter Michael Sullivan about the latest in the investigation into the attacks. April 24, 2019  North Korean leader Kim Jong Un and Russian President Vladimir Putin will meet in person at a bilateral summit in Russia on Thursday, as U.S.-North Korea nuclear talks remain at a stalemate. 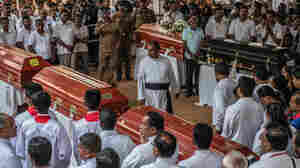 April 24, 2019  Sri Lanka holds funerals for victims. Jared Kushner says the probes into Russian interference have been more damaging than the interference itself. North Korean and Russian leaders to meet Thursday. April 24, 2019  A judge sentenced the leaders of the protests to up to 16 months in prison. 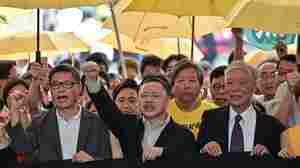 Rights groups said the sentencing would have a chilling effect on future demonstrations in Hong Kong. April 23, 2019  NPR's Audie Cornish speaks with Sarath Dissanayake, charge d'affaires from the Embassy of Sri Lanka in Washington, D.C., about what is now known about the Easter Sunday attacks in Sri Lanka. April 23, 2019  The victims of Sunday's bombings in Sri Lanka came from around the world. As funerals and burials begin, the victims are being remembered. April 23, 2019  Mourners and religious leaders gathered to say goodbye to more than 300 people who died in a string of bombings on Sunday at churches and hotels. Among the dead are 45 children. April 23, 2019  NPR's Ari Shapiro talks with Mathew Schmalz, associate professor of religious studies at the College of the Holy Cross, who studied Christian communities in Sri Lanka, including those attacked Sunday. April 23, 2019  NPR's Audie Cornish speaks with terrorism expert and former FBI Supervisory Special Agent Ali Soufan about the ISIS claim of responsibility for the Easter Sunday attacks in Sri Lanka.